Irish snowman Christmas ornament features LED lighting along with a shamrock sign. This Irish ornament is from Kurt S. Alder. This Irish snowman is a Christmas ornament that features LED lighting that changes color along with the blinking pattern. The Irish snowman ornament is enhanced with a green derby hat and sweater along with a scarf and carrot nose. He is also holding a shamrock shaped sign that says, Luck of the Irish. The Irish ornament is ready to stand on a flat surface or hang on your tree with the included gold cord. The Irish tree ornament measures 3 1/2" tall and he is gift boxed, with the included batteries, along with a shamrock history card, complements of The Irish Gift House. 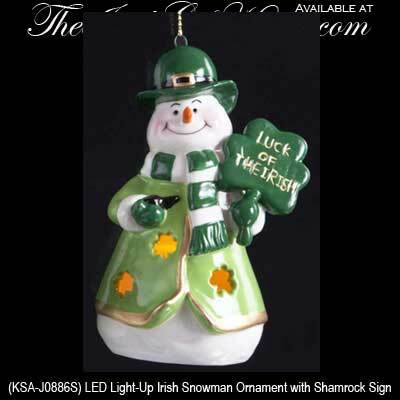 Irish snowman Christmas ornament features LED lighting along with a broom and a shamrock enhanced pot of gold.